So we have all been sick lately, this time of year, gotta love it! So I decided to take advantage and teach the kids about GERMS!!! Yes, the icky, nasty things that make us sick ugh! Of course I heard the "EWWWW!!! And Gross!!!!" I explained that germs are found all over the world, in all kinds of places. 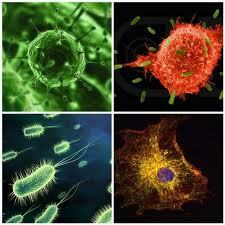 There are four major types of germs: bacteria, viruses, fungi, and protozoa. They can invade plants, animals, and people, and sometimes they make us sick. I wrapped up the lesson by letting them know that good hygiene and hand washing is all we have to do to keep the bad germs away and stay healthy. Kids were really happy to hear that and I think they will defiantly be willing to wash those hand better now !